Blog inspiration from my friends. I had to go make a Simpson version of me after I saw it on Mary Kay’s blog. Then I found out that she got it from my other friend, the ducky one. My other inspiration came from Houston. A while back she posted about what she could see from her computer. A little homage to her home. I told her that I was going to do the same thing and then never got around to it. So, here I am! I took pictures of my living room today. That’s where I sit on my laptop and blog and watch TV and watch the kids play Wii and watch Wade play Wii and generally spend a lot of time. Next up…the matching chair. Big enough for two adults to snuggle in. 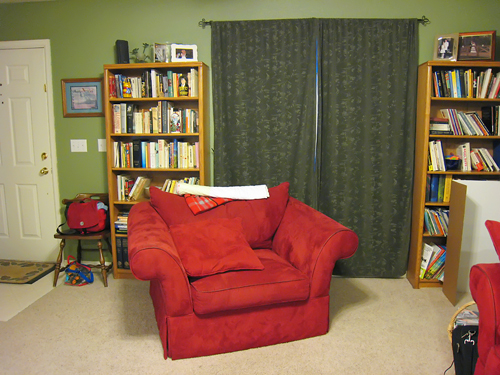 Our bookshelves…we went through them recently and donated *many* books. The curtains I made myself. Nothing fancy, but they work. 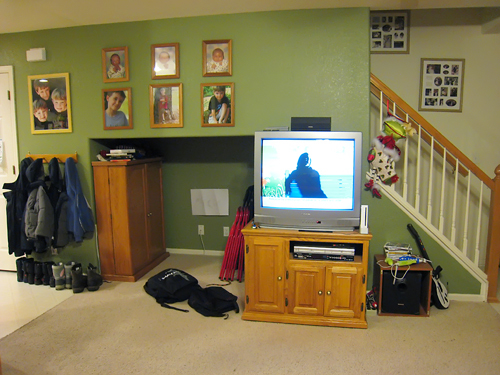 As we continue around the room…the TV wall. That little nook is supposed to be for your big screen TV, but it’s so far off center it’s really not good for TV viewing. We use it as a little storage nook. You can see all the Wii paraphernalia to the right there. The froggy stocking that I got for Christmas that I just can’t bear to put away. She is just too fancy to be put in a box! 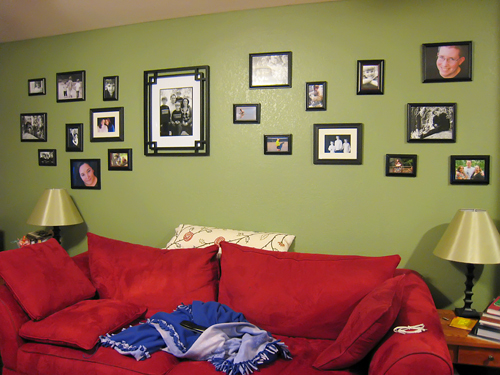 The boys pics on the wall. I keep their baby pics up all year and just change out the bottom ones each birthday (or that’s what I’m supposed to do anyway). 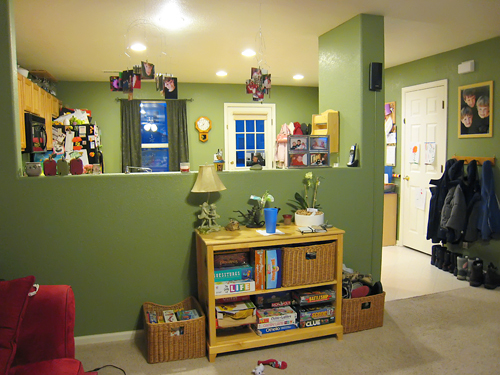 And finally…the half wall between the living room and kitchen. Our game shelves. (Yes, they are always this neat.) And more pictures, of course. We got these cool picture mobiles for Christmas and I’ve filled them with my faovorite 4×6 prints from the last few years. You can kind of see some of my favorite froggy things there on the top of the game shelf. If I ever get around to showing you the rest of the house, you will get a better picture of my obsession with the little amphibians. Love the house pics…looks so cozy! Love the green. Love all the pictures. It really looks like a comfy place. So lets see… We have a ducky friend, a bird friend and a frog friend… hum… anyone else care to share their obsessions? We have a ducky friend, a bird friend and a frog friendâ€¦ humâ€¦ anyone else care to share their obsessions? I love the pink shoes, too.